Six million was the number of signatures the Chartists declared had signed their petition. As ‘Revoke Article 50’ beats its record, could the final demand – for more regular general elections – be within reach? A general election is surely the best outcome from Brexit deadlock, and with Labour polling ahead, it could deliver us from chaos. UNISON’s Dave Prentis joined the call on Friday, saying: “It’s time for a general election to settle Brexit once and for all”, with FBU’s Matt Wrack echoing his call: “Theresa May should resign and there should be an immediate general election”. Saturday’s march in Swindon reminds us that the Brexit debate is not happening in the abstract. As Unite members and the wider community rallied in defence of 3,500 jobs at risk by Honda’s proposal to close its factory in the town, it is uncertainty over Britain’s departure from the EU along with the decline in demand for cars where many aim their blame. Unite’s analysis shows that 130 jobs in manufacturing are being lost every day: Labour’s plan of investment and nationalisation could not be more desperately needed by workers across the country. Yesterday’s April Fools by the government was its national minimum wage announcement. The baseline salary will rise by 5% this year – still not enough to live on, let alone in keeping with the rising cost of living. In marking its 20th anniversary year, UNISON have issued a statement demanding the NMW be brought in line with the real living wage, and for all age bands to be scrapped. As the GMB pointed out, the rate would stand at £11.41 an hour had it been raised in keeping with bosses’ pay rises. The bulk of industrial action this week is from the transport unions. 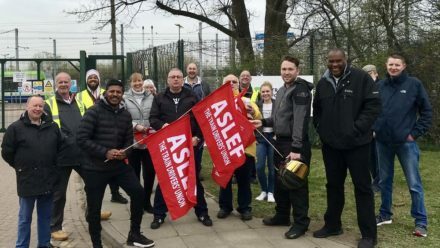 On Thursday, ASLEF tram divers in Croydon were on strike, demanding a fairer pay and pension settlement. Members of TSSA in three separate workplaces are also gearing up for a strike. The union at Arriva Northern Rail returned a 100/100 strike ballot in favour of walking out over workload. Freight train workers at DB Cargo are being balloted for action as jobs are offloaded to a company that won’t recognise the union. Meanwhile, strike dates have been announced for workers protesting pay at CIE. Elsewhere, security staff at Southampton hospital will begin a strike on Friday. The Unite members will walk out for a total of eight days, and are demanding protective equipment such as stab vests are provided due to safety risks at work. In a week where a national spotlight has been placed on knife crime, it is shameful that NHS workers must serve in such fear without appropriate protection from their employers. In a previous column, I reported that 40 Post Offices had been scheduled for closure and privatisation into WHSmith chains. Some good news from the CWU though, whose campaign in Kendal has kept the site open. In a matter of months, the FBU has secured a second victory on pensions for its members. The High Court has ruled that firefighters in Wales will be entitled to pension payments for any overtime they work, and demanded the authority make retrospective payments. Got news? If you have a trade union story that deserves to be covered, or if you’re involved in one of the disputes that’s been mentioned, please get in touch – I would love to hear from you.